When we went to Hawaii in january, we did the timeshare trip. You know the one? The kind where you are invited to stay for cheap and watch a 2 hour presentation on vacation club ownership. I have a Hilton Honors membership and they offered me a 5 night stay for $699 at the Hilton Hawaiian Village. On a whim, way back in June of 2015, I bought it. Originally we planned to go in the fall, but with the new teaching job I moved our trip to January (for a small fee). We almost never stay at resort type locations because I am so thrifty. I stay more at Hampton Inns and Hilton Garden properties to save some cash (and give my family a free breakfast). 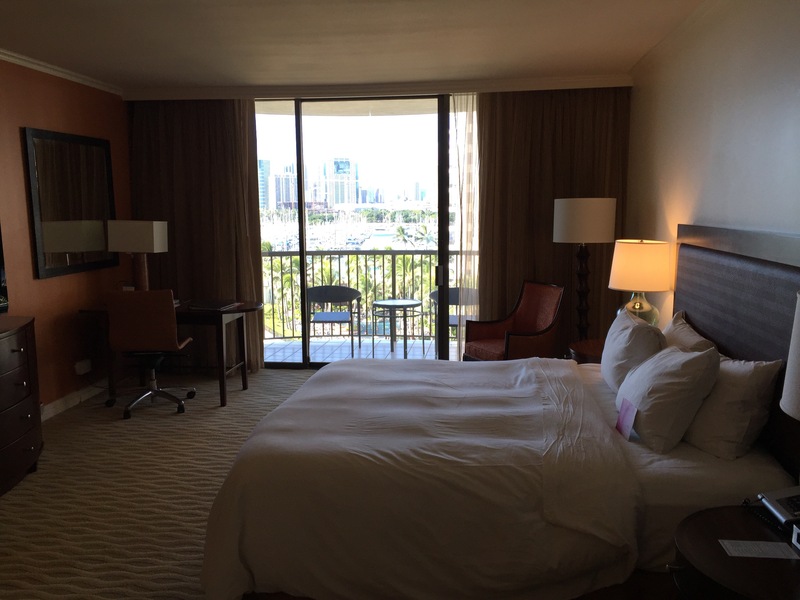 But a while back for mother’s day I stayed at a Loews and loved it. I decided I deserved a little resort life. When we ate on the property, we ate most of the time at the Tropics Bar and Grill next to the beach. I enjoyed their happy hour. There are multiple restaurants with different foods and prices. The cheapest one had take out pizza and food I didn’t want in Hawaii. There was a Starbucks on site that we used for early morning coffee on the way to the airport, but we also tried the other coffee shop (that also had amazing ice cream) on site. There are a lot of choices on site. There are several pools on the property with an ability to order food and drink poolside. Yessss. Getting lounge chairs by the pool can be competitive, but I prefer a chair a row or so back so I don’t get splashed by kids. The only bummer about the jacuzzi was that it was adjacent to the kiddie pool and frequently had a lot of kids in it. I don’t mind kids, mine are just grown so I don’t need to hang out with lots of them. Okay, we didn’t really see these. Because the guy at the timeshare presentation said we would be able to see the free Friday firework show from out balcony. But we could not. At all. You really need to be down at the beach to see it. 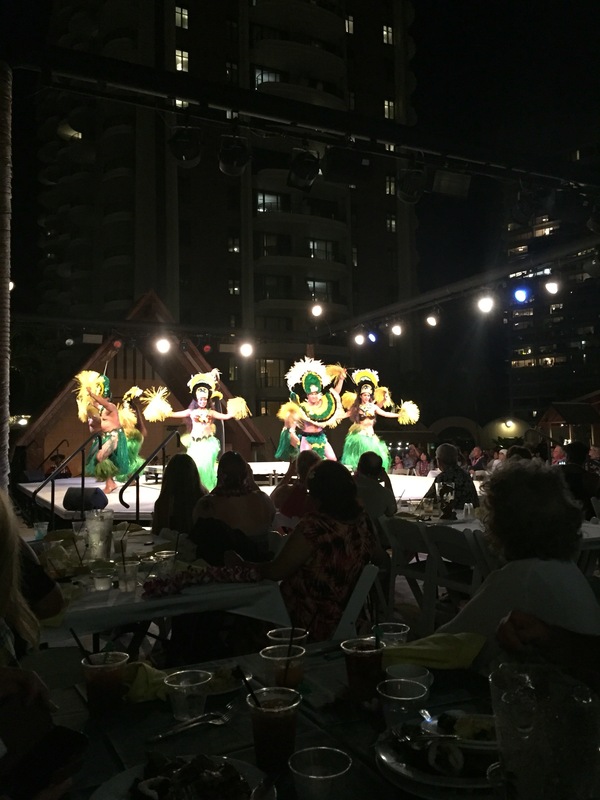 Fun luau, but not the best luau we had ever seen. We enjoyed meeting the people at our table. It turns out Dec/Jan is a popular time for Australians to visit Hawaii. The luau is on the roof of the parking garage, and we could actually hear it from our balcony on other nights. The food was okay, but the performances were good. The best out of all three we have seen is Paradise cove. One night we decided to get a movie and chill in the room. We were so beat from our busy day out and waking up at 4 am (time difference), we thought relaxing in our room was in order. 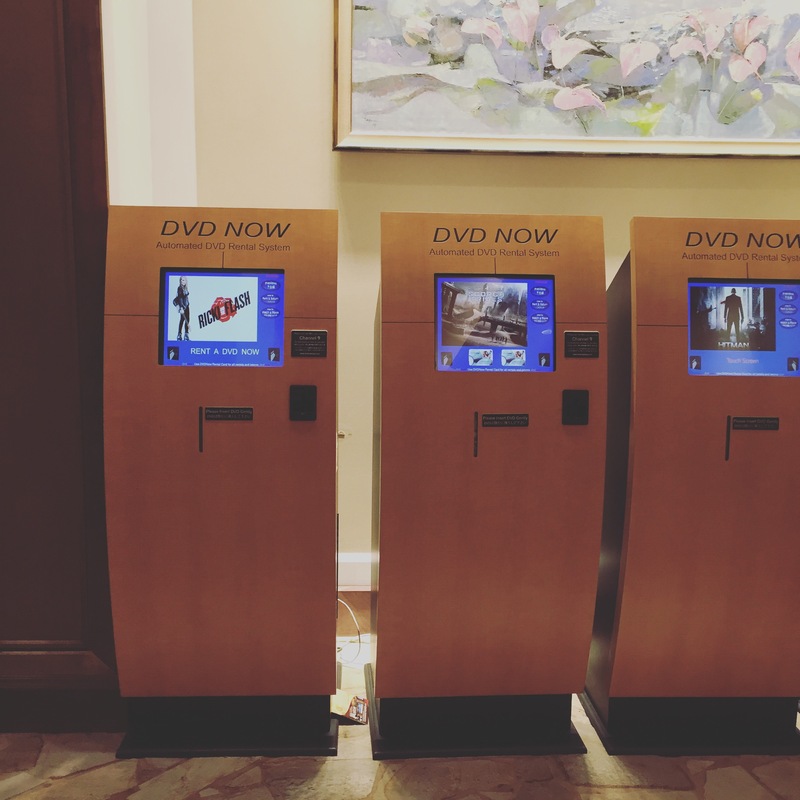 When you check in, they give you a card to access the dvds and then you return them the next day. 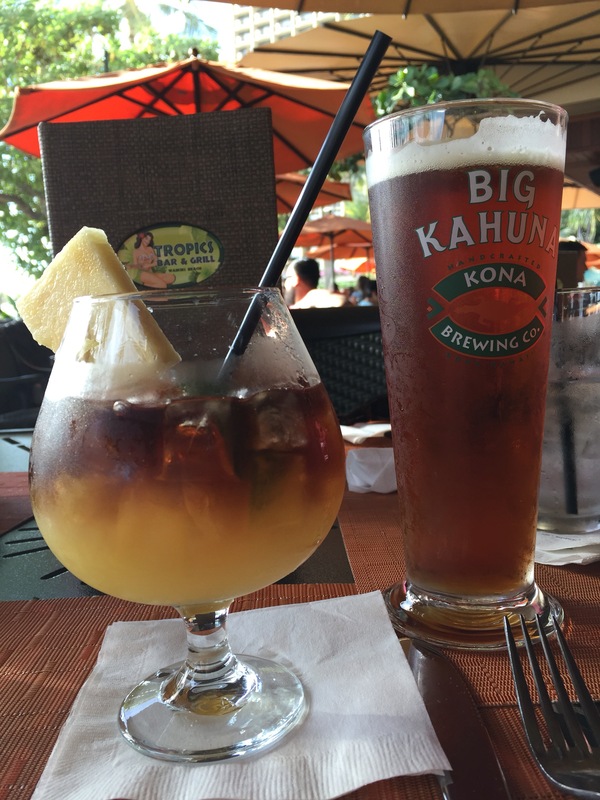 We enjoyed our Hawaiian stay. The staff was extremely helpful all of the time. The grounds were clean and everything was beautiful. 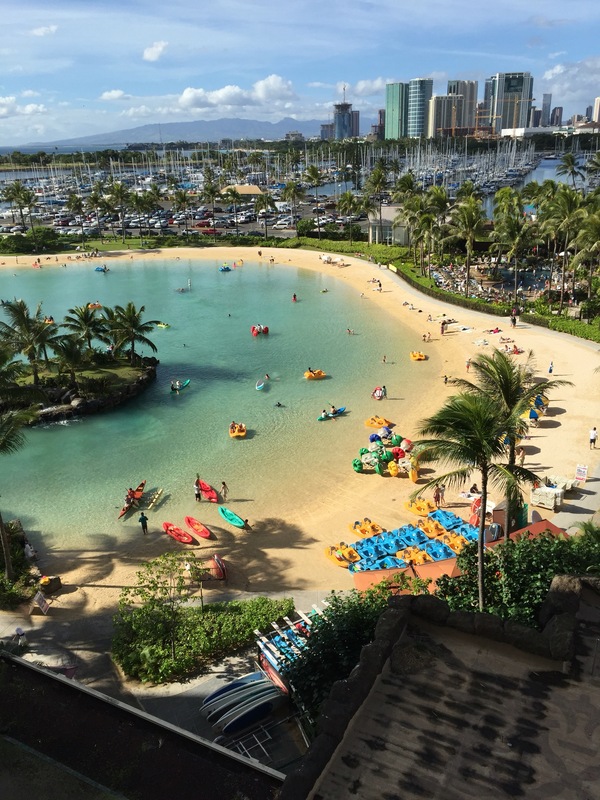 All in all, the resort is a very convenient way to visit Waikiki. The last time we came to Oahu was 11 1/2 years ago. So much has changed in Waikiki, we almost didn’t recognize some parts. We did a lot of things we hadn’t done previously. I think if we had younger kids all of the amenities would have been appreciated even more. Renting movies for kids, the food options, the pools, club penguin for kids, etc. But as a couple who enjoys exploration of new places, a resort isn’t as necessary for us. 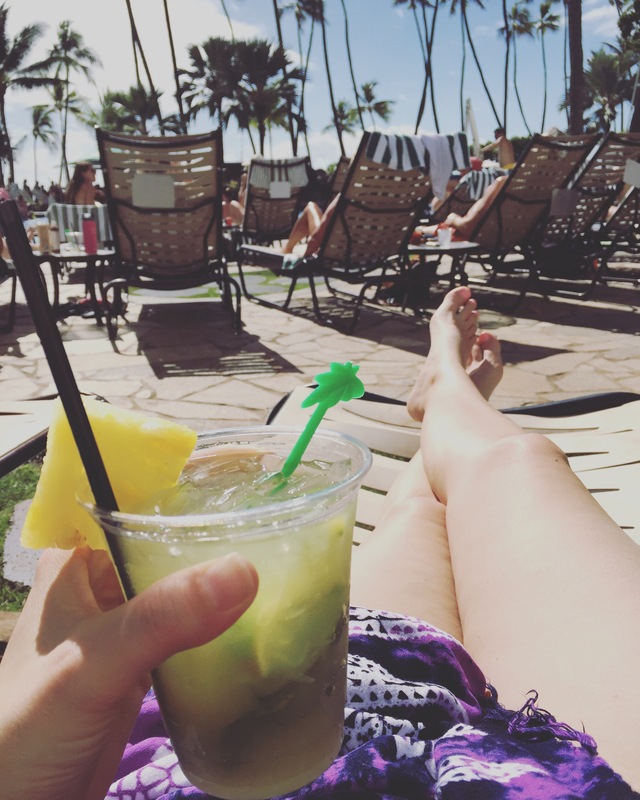 But we loved our pool lounge time, charging drinks to the room, and the pineapple salsa nachos (minus the pork) at Tropics Bar and Grill. And honestly, in terms of Waikiki hotel locations, the Hilton Village is in one of the best spots. Great access to transportation and beaches. The one thing I wish I would have done, was morning yoga at the resort. But the morning I was headed out, I was digging in my suitcase (under the safe in the closet) and hit my head on the in room safe. Hard. So I gave up on yoga. I am so glad we got the chance to revisit Oahu and enjoy time together. Have you been to Hawaii? Do you love resort life? It would be fun to have a vacation home there!